This topic contains 4 replies, has 2 voices, and was last updated by Oritro Ahmed 4 years, 11 months ago. 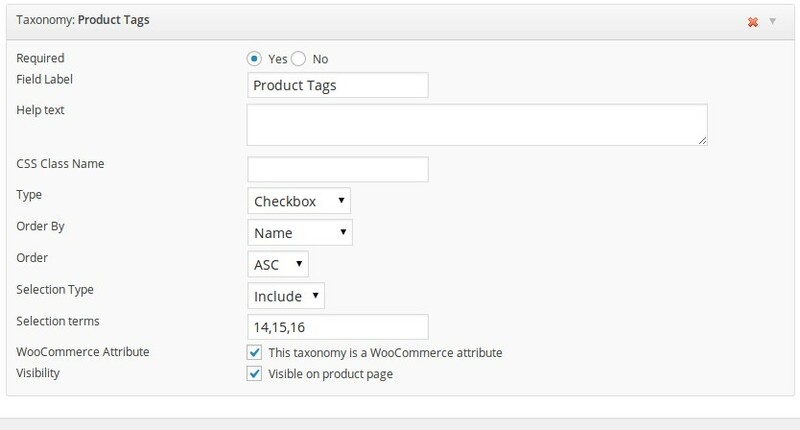 I have WP User Frontend Pro, and I am using Product Tags, with the Include and Checkboxes options. It is not properly including only the terms that I would like to show. Sorry For being late. There was a Update going on, We missed your post. Here is a Screenshot, I followed your method, and seems like you are right. When there is multiple tag ID, Not all of them is showing. Thanks for your Post, I submitted a bug report regarding this to the Developer team. Any updates on this? It is seriously delaying our project and it has been over 1 week. After the Release of WordPress 3.9, We faced quite a large number of problems. So we are releasing a new patch for all of them, including Product Tag related problems. It should be there in a few days. The topic ‘Product Tags not including on form’ is closed to new replies.